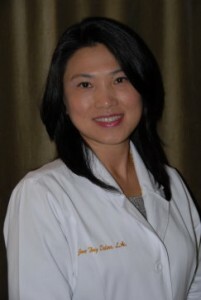 Jane Tong Delore, L.Ac., graduated from Five Branches University in San Jose, California with a Master’s of Science in Traditional Chinese Medicine (TCM) where she received 3,224 hours of vigorous training and treated hundreds of patients with Traditional Chinese Medicine. Jane’s medical knowledge and skills in TCM are highly comprehensive, informed by studying under and working with some of the most successfull acupuncturists and doctors from China, Taiwan, and the U.S. Highlights of Jane’s training include TCM Trauma and Orthopedics, sports injury diagnostic exams, and muscle channel technique with Dr. Frank He; TCM Gynecology with Judith Tongetti, L.Ac. ; TCM Pediatrics with Dr. Lucy Hu; Western Physical Exam with Dr. Shuli Li from Stanford; TCM External Medicine and TCM Dietetic with Dr. Jeffrey Pang; Western medicine training with Dr. Alan Wong, M.D. ; and Psychology & Counseling with Dr. Laury Rappaport. Jane had her first acupuncture internship at the California Pacific Regional Rehabilitation Center (CPMC) in San Francisco where she observed acupuncture being integrated with Western medicine to speed recovery in inpatient acute and post-acute rehabilitation care, where patients were recovering from severe conditions such as post-stroke, post-neurosurgery, automobile accidents, and sports injuries. She also had an extensive externship following Dr. Polin Shyu and George Lu, L.Ac. at Nurture Acupuncture, one of the most premier acupuncture practices specializing in fertility treatments in the Bay Area, with research supporting the success rate in pregnancy when acupuncture and traditional Chinese medicine are integrated with Western fertility treatments. In the past several years, Jane Tong Delore has had success providing acupuncture treatments to patients with various ailments and helping them overcome many health issues, including fertility, sleeping disorders, stress and emotional issues, gastrointestinal disorders, migraine headaches, arthritic pain, frozen shoulder, carpal tunnel syndrome, sprain and strain, back pain, knee pain, post-stroke and post-surgery recoveries, to name only a subset of conditions she has treated. Jane worked full-time with teams of world-class medical doctors at Stanford Hospital and Clinics in the past as a Cantonese and Mandarin medical interpreter and translator, where she acquired years of healthcare experience interfacing with patients and providers and translating medical documents in a wide range of medical specialties in clinics, hospital, emergency and surgeries. Jane is passionate about teaching; she was the interpreter internship coordinator at Stanford Interpreter Services, coaching Stanford graduate students in Mandarin interpreting, and coaching Cantonese interpreter students at City College of San Francisco. Jane is an active advocate for patients with limited English proficiency. At her current practice, Jane believes the healing process begins with clear communication, treating people with respect and dignity in a secure, trusting and comfortable environment. Jane named her practice Blossom Acupuncture as a paradigm for the TCM way of life, a beautiful bloom in a positive catalytic sense; when a person is healthy and happy, their surroundings naturally change with them in many positive ways. Jane strives to ease patients’ physical and emotional pain by offering precise diagnosis, treatments, and care so they and their environment can enjoy the beauty of their blossoming time together.